If you believe the time to buy is when the news is bad, then it’s time to look at Nigeria. The country will release second-quarter gross domestic product data on September 4. Analysts expect the report to confirm recovery from the country’s first annual contraction in 25 years. More important for investors, the stock market turned bullish. Investors in the U.S. can buy the Global X MSCI Nigeria ETF (NYSE: NGE). The chart below shows the price action and a relative strength (RS) indicator. RS is pushing toward a buy signal. The indicator is at 0.97. The 0.99 level is a buy signal. RS compares each stock or exchange-traded fund (ETF) to all other stocks and ETFs. By buying when RS is high, you’re buying market leaders. A stock might look like a bargain when it’s falling and RS is low. But NGE shows we never know how far prices can fall. Waiting for an upturn is safer than buying on the way down. 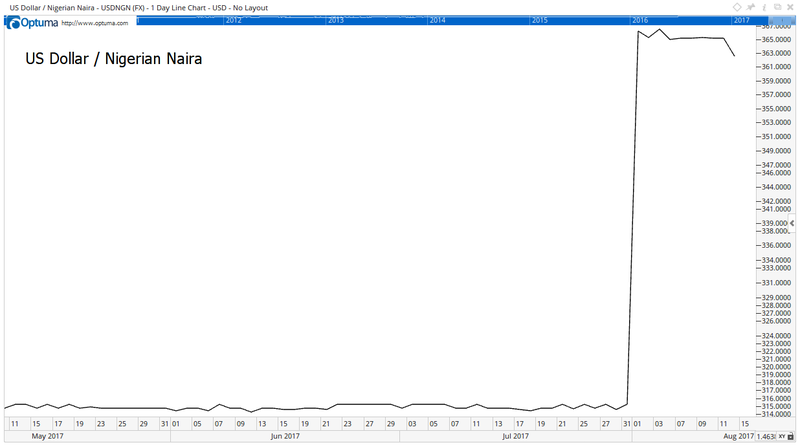 The chart above shows Nigeria’s stock market turned up. This follows a long decline. And it coincides with an improving economy. Nigeria’s economy should grow 0.8% this year. That partly reverses a 1.6% contraction in 2016. The economy relies on oil, the nation’s biggest export. Increasing stability in the country resulted in increased oil production. Stability grew after an aggressive response to Boko Haram. This terrorist group has killed tens of thousands of people since 2009. They’ve displaced about 2 million residents. The government recently increased military action against the group. This reduced their influence. The government also took on black market currency trading. They gave up enforcing an artificially strong exchange rate. This led to an immediate 16% currency devaluation. The government is fighting Boko Haram and completing economic reforms to improve the quality of life in Africa’s second-largest economy. The results could benefit U.S.-based investors in NGE who want exposure to Nigeria or oil since the ETF’s performance will track the trend of both. In the long run, this could be the biggest winner in the world as Nigeria grows its middle class.